Young Riddle has distinguished himself as a conductor, educator, award-winning composer and now arts presenter as music director of the Nimbus Ensemble. After early training on the piano and trumpet he turned instinctively toward composition. Dr. Riddle went on to study at USC with composersRobert Linn and Morten Lauridsen, open form music with Earle Brown, and discovered a passion and talent for conducting, leading performances of Schubert’s Symphony no. 8 and Haydn’s oratorio, The Creation. Winning a scholarship to the Aspen Music School he studied with Charles Jones and Elliott Carter, andearned critical praise for his Violin Sonata and Brass Quintet (which won the Annapolis Brass Quintet/Goucher College competition, adjudicated by major composers Christopher Rouse, Robert Hall Lewis, and members of the quintet). Pursuing two master’s degrees at Northwestern University, Dr. Riddle continued his compositional and analytical studies, and was accepted into Victor Yampolsky’s prestigious conducting seminar. While in Chicago he conducted numerous ensembles, becoming the principal conductor of the North Shore Chamber Orchestra (who commissioned his Excursions Through the North Shore) and made his debut in a widely broadcast National Public Radio concert from Pick-Steiger auditorium conducting Ravel’s Pavanne pour l’enfant defunt, Copland’s Appalachian Spring, and Beethoven’s Symphony no. 1. Conducting workshops followed with Pierre Boulez, Leonard Slatkin, Maurice Abravanel and Otto Werner Mueller. Dr. Riddle returned to Aspen as a conducting fellow, and to USC finishing a doctorate, conducting their New Music for Orchestra series and teaching in their Composition and Theory department. He went on to do postdoctoral work in interactive algorithmic composition at Stanford University’s Center for Computer Research in Music and Acoustics, and has taught widely at Pepperdine University and CSULA, in addition to USC’s Thornton School of Music. 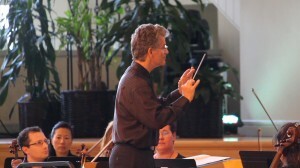 In addition to his conducting activities, Dr. Riddle continues to compose richly textured works for the concert stage and various current media, and lives in Woodland Hills with his wife Karen and daughter Marie.